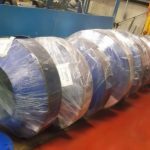 As a solution provider to our customers CPM offer a range of contracts, including fixed price maintenance packages, where we commit to maintain all plant on site at a fixed cost, regardless of the number, or cost of failures. This gives cost certainty to our clients, and incentivises both sides to work together to achieve greater levels of cooperation, to make sure production levels are maintained, and downtime is minimised. One of our clients made the switch after CPM developed a solution for recurring failures which had been ongoing for several years. The issue was that many of the cooling fans on the site were failing, and with around 200 fans of various makes and models in operation across the plant, many in difficult to reach locations and needing a mobile crane to replace, the cost of failure was high. Initially we dealt with each failure as it arrived, identifying the make and model of the fan then diagnosing the faults, and repairing the unit. 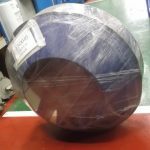 Due to the wide range of fans there was often a requirement to order parts which could take up to a week, this downtime coupled with the crane hire, man hours and repair costs made failures expensive and time consuming. With the large number of fan designs on site it was not practical for our client to stock spares for each type due to the space needed, expense, and uncertainty over failure rates. It became clear this was an ongoing issue and becoming ever more disruptive. CPM approached our client and opened a discussion as to how the problem could be addressed, it was apparent the failures were a result of the environment in which the fan operated, and the huge variety of fans on site only complicated matters further. With our commitment to being a Solution Provider we were not satisfied with offering a basic repair service. We knew we could assist in improving the client side approach to maintenance, using our knowledge of the solutions available, and our experience of the practical implementation of these solutions. To keep repairing or replacing the fans on a like for like basis merely allowed the issues to continue. Our aim was simple, reduce failures, and limit the range of fans in use to streamline maintenance, and reduce spare part inventory. To do this we developed a bespoke interchangeable fan design which would enable flexible configuration of the production line, whilst allowing production to continue unchanged. We applied condition monitoring techniques, and coupled with our experience our team was able to identify the root cause of the failures. The main issue was a build-up of material on the fan blades. The production line (in a mineral processing plant) had high levels of airborne particulate, and as the air moved through the system this material was bypassing the filtration systems and coating the fan blades. This increased the weight of the fan, with material settling on different areas of the fan blades, for example a larger accumulation at the root where the rotational speed is slowest, with accumulation of the mineral increasing the weight of the fan by around 10-15%. While this not may sound like much fans are precisely balanced to operate at maximum efficiency, and motors are designed to operate at particular speeds with a stated load, changes to these parameters can greatly effect performance, efficiency and lifespan. Further to additional rotating load, the moment of inertia is larger during start up, drag increases, and uneven distribution of the additional weight increases strain on the shaft and bearings, leading to repeat failures. It was clear that the build-up of the mineral on the fan was the main cause of the problem and any solution we provided would need to address this issue first and foremost. CPM redesigned the fan unit, sourced and applied a low friction coating to the fan blades, and made changes to the cowling, seals and motor cooling system to improve the IP rating. Further to these alterations we devised a standardised coupling for the fan which allows two different fan sizes to be fitted to the existing motors, eliminating the need for major changes to the motor sets. The coating proved to be a success as the mineral was no longer able to stick as easily to the fan blades, and therefore the fans were able to operate much longer than previously before needing to be changed. Not only have failures been reduced but as CPM now hold fans in stock as part of our fixed price service, the change outs can be undertaken in just a few hours. Additionally the interchangeable fans allow production capacities to be altered quickly and easily and have added a new dimension of flexibly to the operation of the plant. The saving for the client from this project have been huge, not only do they save on man hours and plant hire, but downtime as a result of the fan failures has been drastically reduced. If you would like to learn more about our fixed price service contracts, condition monitoring or how CPM can provide a solution to streamline your maintenance activities contact one of the team today.